April-October: Daily 09:00-23:30. Runs every 10 minutes. November-March: Daily 09:00-23:20. Runs every 15 minutes. 04-15 March & 07-25 October 2019. The funicular railway in Prague runs from Ujezd street in the Lesser Town (Malá Strana) to the top of Petrin Hill. On the side of Petrin Hill is park and woodland. At its summit, set in landscaped gardens, is the Petrin Lookout Tower, a mirror maze, a church and an observatory. The funicular makes a halfway stop, in both directions, for passengers that wish to dine at Nebozizek Restaurant. 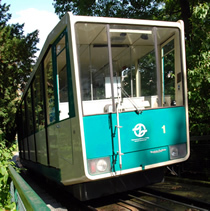 The funicular railway forms part of the Prague public transport network, so a single ticket for travel on trams, buses and the metro is also valid on the funicular: Travel around Prague by public transport. Thus many passengers arrive by tram (tram stop Ujezd), then use the same ticket - exceptional value for a nice excursion away from the hustle and bustle of the city. If you arrive on foot, funicular tickets can be purchased at the terminal, which is a 10-15 minutes stroll from Charles Bridge in one direction, and the same distance from the National Theatre in the other. A nice trip at any time of the year (unless the weather is really poor) is to take the funicular railway to the top of Petrin, spend a couple of hours strolling around the summit visiting the attractions, then to walk back down through the trees and parkland - possibly stopping off on the way at Nebozizek Restaurant for a bite to eat. The funicular railway opened on the 25th July 1891, operating with a water-balance drive system. It ceased running in 1916 due to World War I, then resumed operations in 1932 following its conversion to an electrical drive system. It closed once more in 1965 after landslides on Petrin destroyed the funicular's tracks. But since re-opening in 1985, the funicular has been in more or less continuous operation (aside from bi-annual closures for maintenance). The funicular passes through the Hunger Wall, which was commissioned by Emperor Charles IV in 1360-1362. It gained its name in memory of the fact that it was built during hard times to provide employment for the residents of Prague. The wall formed part of the city's medieval fortifications.